Hey everyone! This will be my first post on the blog. You guys can call me Sid and if you ever see the name Sidx30 out on the internet, it's most likely me! I am one of the awesome 3D artists working on Galactose and I am going to a share a bit on what I have been making.....err destroying to be precise! I've been working on taking various parts out of the hot dog cruiser and making them into broken parts and debris. This will allow us to have a more realistic cruiser explosion and it will also make it more dangerous to be around a cruiser when it explodes. 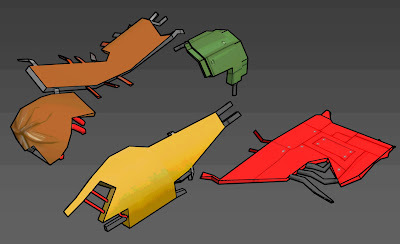 These parts will also be lingering around in space creating more dynamic obstacles for the player to take into account. I've attached a little screenshot showing what I've made below! That's all for now. Stay tuned for our weekly updates! We are going to be pushing out some really cool stuff!